2001 has been the year of the spy, with Spy Kids becoming a blockbuster and Tailor of Panama becoming a footnote in Pierce Brosnan's career. 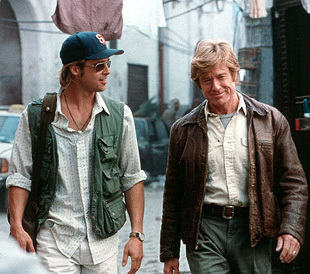 The last spy entry of the year will come from the skilled hands of Tony Scott (Top Gun, Enemy of the State), and re-teams the River Runs Through It duo of Robert Redford and Brad Pitt. They will play a retiring CIA operative and his protégé, respectively. As the action unfolds, we see Pitt's character, Tom Bishop, arrested by the Chinese government and accused of espionage. This film will fracture time to tell a lot of the story using flashbacks, so that we have a better understanding of the history and relationship between the two characters. Catherine McCormack of Braveheart fame plays a human-rights activist who becomes Pitt's lover. The good here is that Brad Pitt is back in movie-star mode, for this film as well as Ocean's Eleven. Fresh from a run of smaller indie films and controversial roles such as Narrator in Fight Club, his next two performances are mainstream films with big-time directors and casts. Due to his eccentric career choices, one of the most recognizable actors of this generation has managed to star in only two $100 million-making films, Interview with the Vampire and Se7en. Yes, that does mean he hasn't had a blockbuster since 1995. There exists the possibility that he will double this total in a four-week period at the end of the year. Redford continues to show the class and elegance of a true living legend, as he tapers off his work and selectively chooses parts that interest him. The only two films in which he has acted in the last five years are Up Close and Personal and Horse Whisperer. In short, we know this script must have something special going for it to bring him on board as an actor.